The first multi-state tornado outbreak of the spring season is forecast on Tuesday from Texas northward into Nebraska, with storms rolling eastward into Missouri and Illinois through early Wednesday. This outbreak may be followed by more severe weather as the week continues. For at least a week, computer models and the weather forecasters that rely on them have hinted that the end of April would be a tumultuous one across the Plains, and on Monday, forecasters at the Storm Prediction Center (SPC) in Norman, Oklahoma sounded the alarm by issuing a "moderate risk" outlook for Tuesday. This outlook calls attention to the threat for "significant severe thunderstorms" that could spawn "tornadoes, some strong" in addition to very large hail and damaging winds. 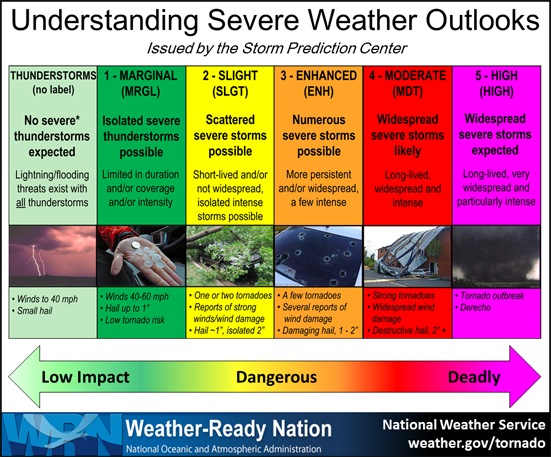 A moderate risk designation is the fourth-highest on the organization's five-point scale, with a "high" outlook corresponding to a greater confidence in a widespread severe thunderstorm outbreak. According to the SPC, which is part of the National Weather Service, about 3.6 million people live within the moderate risk area, which encompasses Oklahoma City as well as Wichita, Kansas. Dallas, Fort Worth, which has seen billion dollar hailstorms this spring, is also on alert for severe storms, though the likelihood of widespread severe weather is lower there, according to the SPC. It's possible that a "high risk" outlook will be issued on Tuesday morning when forecasters review new forecast guidance, or they may even downgrade the outlook to an "enhanced risk." Computer model projection of the jet stream on Tuesday afternoon, showing a dip, or trough, in the jet emerging out of the Southwest. Bill Bunting, the chief of operations at the SPC, told Mashable in an interview that forecasts on Monday night and Tuesday morning will refine the areas under the highest amount of threat, but that this storm poses risks across a broad area. "It only takes really one really intense storm in the wrong area to cause tremendous impacts," he said. 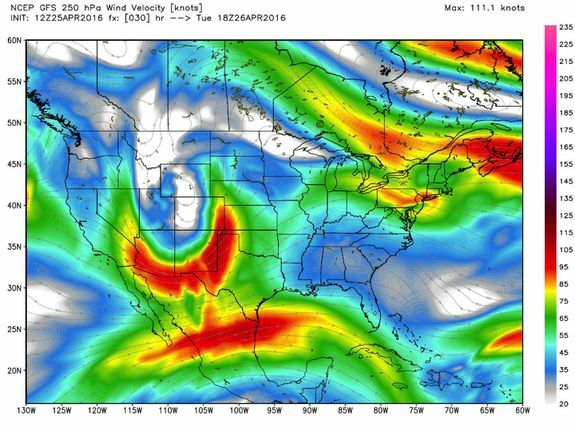 The ingredients for the severe weather include an area of energy in the mid-to-upper levels of the atmosphere that is whirling its way across the Southwest on Monday, and is projected to be in a position just to the west of the Central Plains by Tuesday afternoon. The air flow around this weather system will draw warm, moist air northward from the Gulf of Mexico, at the same time that winds in the upper levels of the atmosphere force the air above Oklahoma, Nebraska and Kansas, in particular, to rise. Such ascent will lead to showers and thunderstorms, which may quickly turn severe. Wind shear, which occurs when winds blow at different speeds or direction at different altitudes, will also be present across the moderate risk area on Monday, Bunting said. At lower levels of the atmosphere, surface winds will be out of the south across Oklahoma City and Wichita, and as is the case in many typical tornado outbreaks, winds will veer with height, blowing more from the west-southwest at higher altitudes. This directional wind shear will encourage thunderstorms to develop areas of rotation, supporting the formation of large hail and potentially large and long-lasting tornadoes. The severe thunderstorms are forecast to last well into the night on Tuesday and into early Wednesday morning, raising the possibility of nighttime tornadoes that can be particularly deadly. While late April is primetime for severe weather in the U.S., as spring essentially clashes with winter (snow is forecast on Tuesday in parts of Colorado), tornadoes have been below average so far in 2016. According to SPC data, there have been 297 tornadoes across the country so far this year, compared to the 10-year average of 436 for the year-to-date. 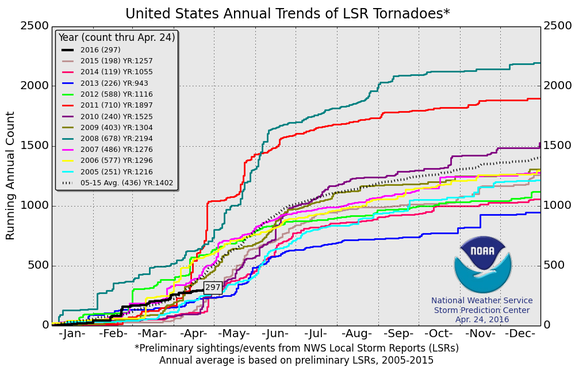 That average may be skewed, however, by 2011's extremely prolific and deadly tornado season. Do longer lead-times do much good? As computer models have become more accurate and forecasters' scientific understanding of the ingredients of severe storm outbreaks has improved, so to has the lead time when it comes to highlighting potential tornado outbreaks. "When you look at the history of the SPC we have gotten better at providing longer lead time information in our outlooks," Bunting said. "As the science has improved our ability to give a longer range of heads up, we try to do that," he said. However, it's not yet clear what amount of advanced notice is required to save more lives. It's possible that giving people several days' notice of a potentially stormy day won't significantly alter their behavior, or may change behavior in harmful ways. For example, a 2011 study found that tornado warnings that have an hour of lead time can lead people to flee a threatened area, potentially putting them in a traffic jam with a tornado barreling toward them. If people only have 15 minutes notice of a tornado, though, they are more likely to seek shelter immediately, the study found. Tuesday's outbreak, which was first heralded on April 21, the earliest such notice yet for the SPC, according to the AP, will test the efficacy of such early notices. Bunting points out that the SPC has many audiences. For some, like emergency managers, mayors and other public officials, the longer lead-time can help them take specific actions to prepare. "Our goal is to provide the information" as far ahead of time as is possible, Bunting said. For others, such forecasts may be a signal to pay more attention to subsequent information.